Tucked away in a closed room at the BlackBerry 10 Jam in Waterloo yesterday, RIM candidly put its cards on the table and let us glimpse two devices that will mark the company’s literal and spiritual turnaround. We’re very limited as to what we can talk about — no names, no specs, no specifics — but rest assured, you should be very, very excited. RIM considers what we saw to be finished hardware but the software is still a work in progress. Nonetheless, we were impressed by how far the company has come since we previewed the Dev Alpha back in June. The team seemed visibly excited and nervous as it showed off its one-two punch of all-touch and QWERTY; we were able to touch, use and critique both hardware and software, and came away with mostly positive impressions. Before we saw the devices, Alec Saunders, RIM’s VP of Developer Relations, spoke of his unwavering devotion to BlackBerry 10 and its developer community. His work has brought us these Jam Sessions, which have sold out in all but one of the 25 locations they’ve been held. Indeed, the energy inside yesterday’s remote Kitchener-Waterloo conference centre — and the ruckus we witnessed at the Toronto event in June — speaks volumes about the loyalty of the developer community. Saunders assured us that, in addition to the 25,000 PlayBook apps that will work out of the box on BB10, there will be thousands of native BlackBerry 10 apps available in App World out of the gate. He emphasized that RIM doesn’t want to be just a pass-through merchant for these folks. With the new “$10,000 Guarantee,” RIM will ensure developers of certified BlackBerry 10 apps receive at least $10,000 in their first year. The company is “de-risking working on BlackBerry 10,” as Saunders likes to say. Andrew MacLeod, RIM’s Managing Director for Canada, emphasized the financial viability of a company many have already dismissed as unsalvageable. “We have $2 billion in the bank and are debt-free. We have 78 million active BlackBerry users around the world, and we’re going to work very hard to excite and delight those customers to upgrade to BlackBerry 10.” MacLeod told us that RIM has been met with an extraordinary amount of enthusiasm from Canadian carriers as they’ve been showing the two devices around the country. He wouldn’t commit to which carriers would get particular devices, but ensured us the worldwide launch would be huge. But such success is contingent on high-quality devices, the first of which is expected early 2013. The finished hardware on the all-touch device is imbued with a distinct BlackBerry essence, an uncomplicated professionalism that only RIM can pull off. Its 1280 x 768 screen resolution makes for an extremely pixel-dense experience, and the OS shines on the glass screen. There is no question that the keyboard, which had already been previewed, is distinctly ‘BlackBerry’ — it learns where your fingers touch the screen, and what words you use most regularly. We had no trouble touch-typing as fast or faster as other virtual keyboards. The UI is fast and fluid, and much further along than we expected. The BlackBerry 10 we saw was a cohesive, fully-featured product, a testament to QNX and its touch-friendly roots. Users will have to get used to gesture-based navigation, that “flow” and “peek” dynamic that has been teased so many times. It’s a completely new way of interacting with a smartphone. BlackBerry 10 will be immediately familiar to existing users, but is not encumbered by its Java-based roots. There is no slowdown, no spinning clock. Multitasking, like on the PlayBook, is a real proposition. The QWERTY device is iconic and familiar. The touchsreen display will have a 720 x 720 resolution and an OS that has been assiduously catered to the 1:1 aspect ratio. Despite our initial reservations, the “flow-and-glide” navigation felt natural to us on the smaller screen after just a few minutes. 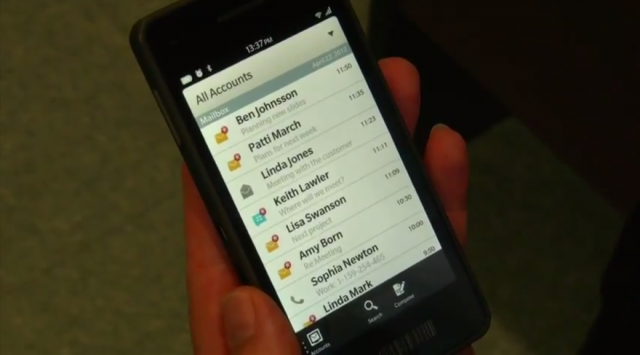 The all-touch BlackBerry 10 device will be released some time in early 2013. The QWERTY product will come next, with a four to six week gap between releases. Hopefully the combo will be exactly what RIM needs to survive, and thrive, in this impossibly competitive market. The RIM we saw yesterday was not a company chastened and morose; these men and women welcome the challenge to prove to consumers, businesses and developers just how quickly they can recover.